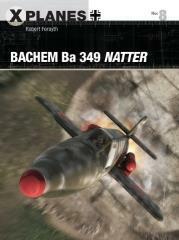 The Bachem Ba 349 Natter was a secretive, vertical take-off, single-seat rocket interceptor intended to offer high-speed defense of key targets. This radical aircraft offered Luftwaffe an inexpensive means with which to intercept and attack Allied heavy bombers using a vertically-launched, semi-expendable machine built of wood and armed with a nose-mounted ‘honeycomb' battery of spin-stabilized air-to-air rockets as well as cannon armament. Launched vertically at 36,000ft per minute, the pilot was expected to fly within range of the enemy bombers, fire his rockets at them, ram another bomber, eject and parachute to the ground.